Gots em. 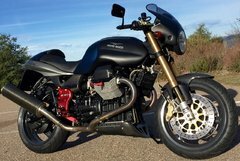 Docc noticed a hammer in one of the first pictures I posted and said I must be a Guzzi mechanic. I was thinking about making a pile of them and taking a picture, but then I'd have to sort them back out.. so.. a few pix. 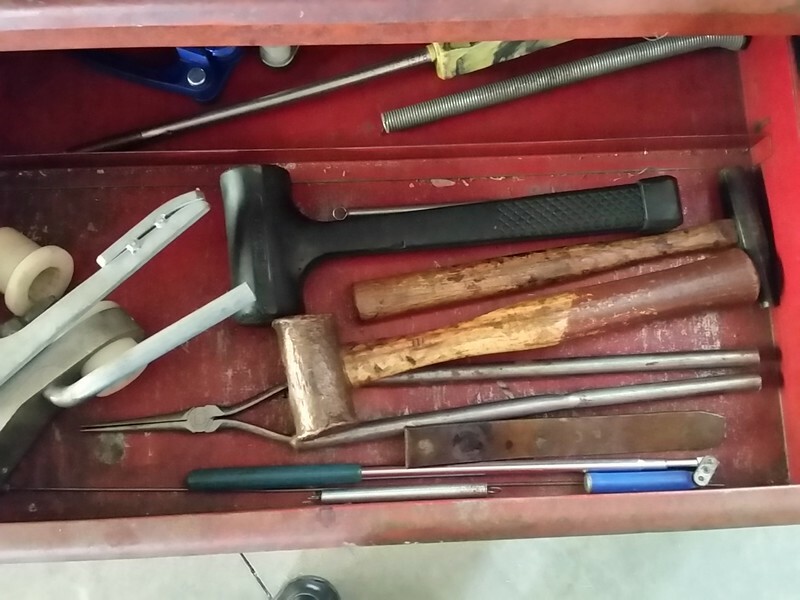 My favorite, and I'd recommend them to anyone doing mechanical work is the one on the left, a copper hammer. You can use it with impunity on steel parts without damaging them, or hit a hardened punch without sending a piece of it straight for your eyeball. A small ball peen in case somthing needs peened, a couple of plastic hammers, leather hammer, and a couple with no use on machines. The hanger roll around. 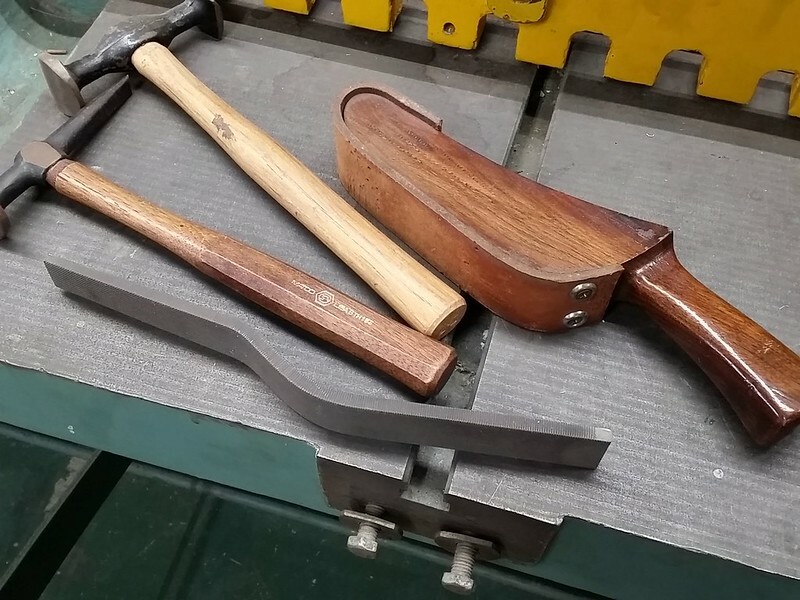 These are home made nylon hammers of different radii used with a shot bag (not pictured, it's not a hammer) to form sheet metal. 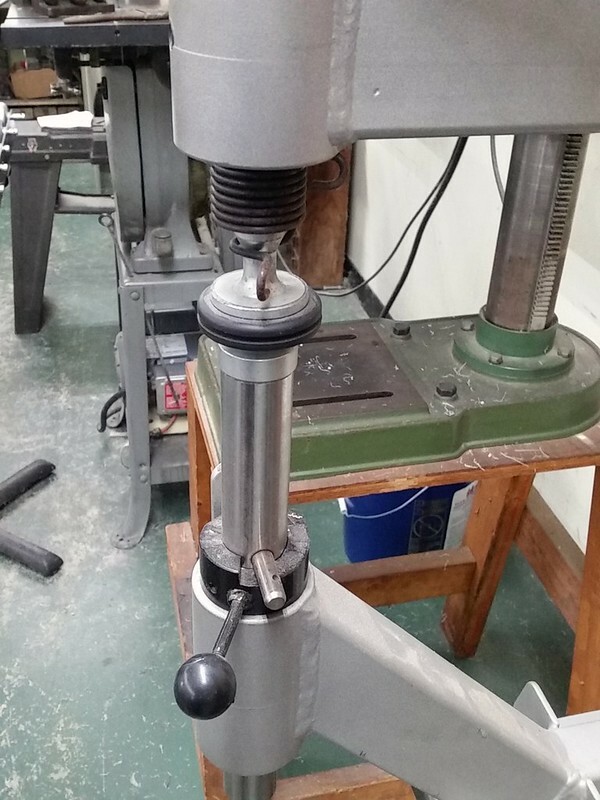 I suppose this qualifies.. a planishing hammer, also for forming sheet metal. 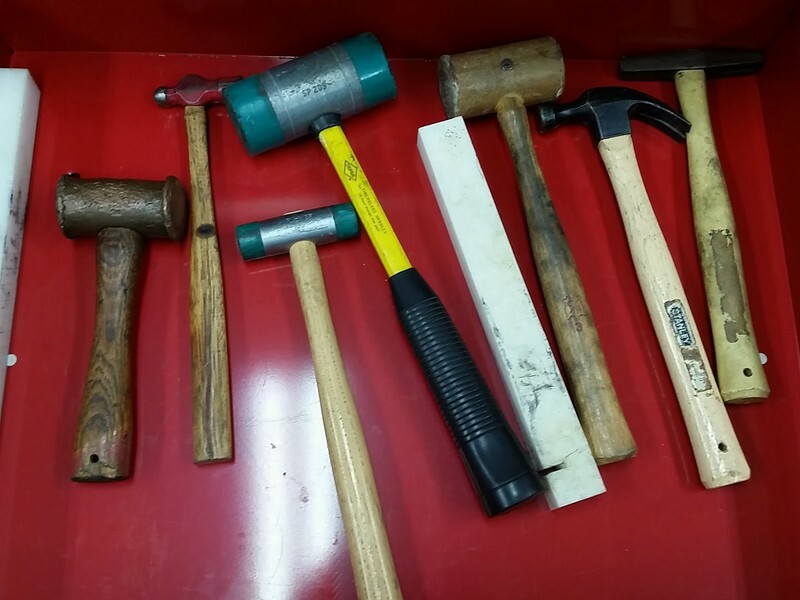 A couple of body hammers, homemade English panel beater's hammer for shrinking bumps, and a shrinking file, which is used as a hammer for shrinking. Two different rivet hammers for..uhhh.. driving rivets. 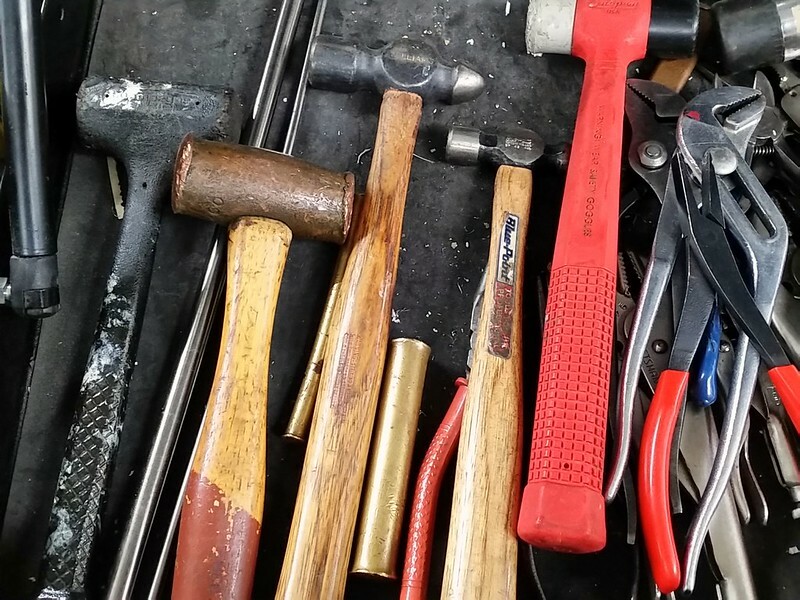 I've said many times that having the proper tool is generally the biggest part of the job. 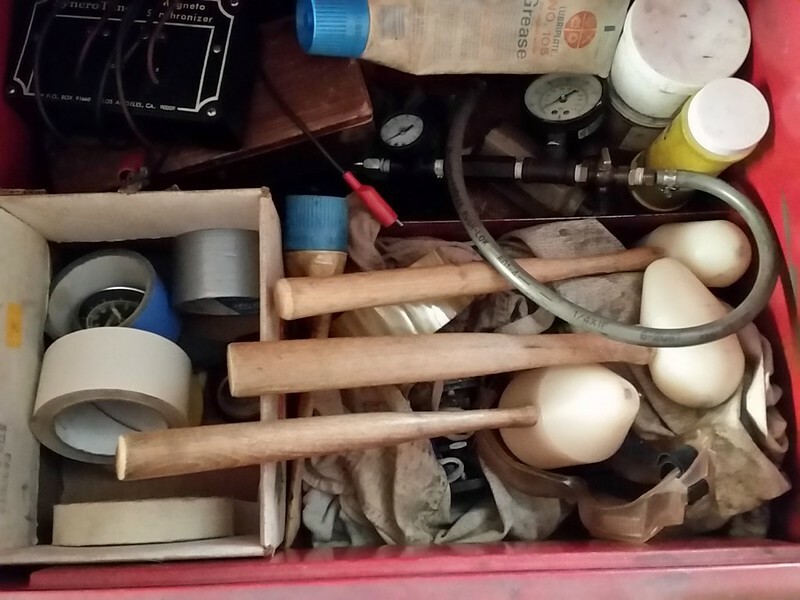 Edit: Oh, forgot the machinist's hammer and jeweler's hammer in my Gerstener box. Sorry, didn't take a picture of them, Docc. I'd be tempted to toss that dead blow in the second photo if it is getting on in age. Looks just like mine before the head of it disintegrated into little bits. I bought it from the Snap-On guy back in the dark ages though. If you bought a DeadBlow from SnapOn it has a lifetime warranty . The hammer in the pic is not a DeadBlow. The heads on this hammer can be replaced. I have that "brass" hammer, second form the right, above, but have never considered a pure copper hammer . . . They rock. Once you go copper you never go back. Not the one with the red handle, but the black one on the far left of the second photo. Good point, but honestly it never entered my mind to inquire about warranty. It's been a long time since I've dealt with Snap-On, but found that they were tougher to deal with on warranty than they used to be. I was surprised at how the deadblow broke up. Lots of sharp chunks flying around. Good reason to listen to the little voice in my head that says you should really be wearing safety glasses when you do this..... but honestly wouldn't normally put them on when using a deadblow. Gotcha.. it is a Compothane (mallet) hammer . I think it still has a lifetime warranty. These hammers of this material will get brittle and shatter w / age . Find a good SnapOn dealer and he should warranty it for you . Caution: To one with a hammer, everything looks like a nail. Found a [cheap!] copper hammer, and a friend who has offered to fit a black cherry handle. Those two things seem paired like Brie and baguettes. Beer and burgers. Wind and winding-it-out! 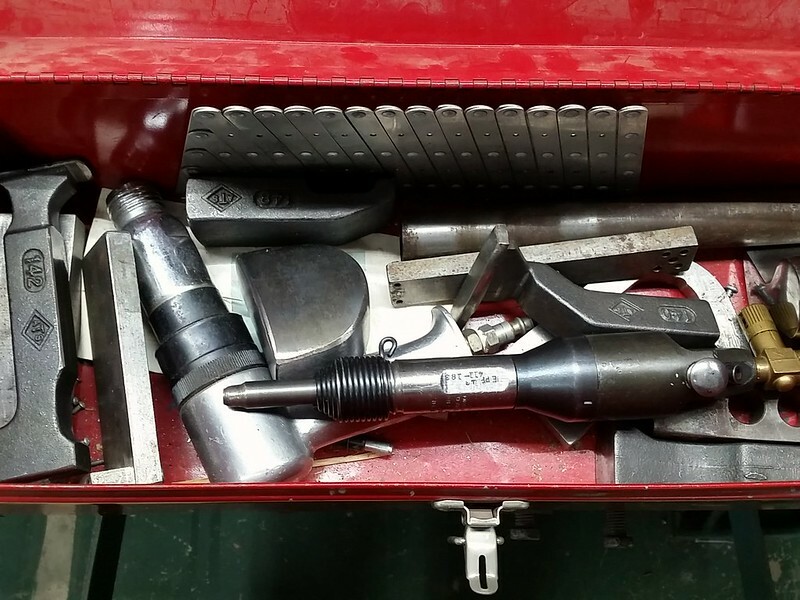 Nice to see the Snap-On duck billed pliers, the black red handled ones are OK but I still miss my old octopus grip pair a co-worker 'borrowed'..........Oh, wrong thread. Like any other hammer. The "file" makes indentations in the bump and shrinks it. The thick leather on the panel beater's hammer does the same thing, but it's more delicate. I don't know why it works.